I had dinner all planned , in my head that is. Had written a grocery list, for this and that. However, the first item I see in the produce department are these gorgeous ripe figs. They are only in season from June until September, in our part of Upstate New York. There is an unwritten rule if you see them at the market, you have to buy them. Okay not really, I made that up. But I just love them, adore them, actually. So it’s a big salad with figs for dinner. Well, you would also have to include some warm crusty bread, and a big cheese platter. Also any cold cuts lurking in the fridge too. That’s how we do salad for dinner. Toss arugula in large bowl with 3/4 or so of vinaigrette and a sprinkle of salt and pepper, place on serving platter. 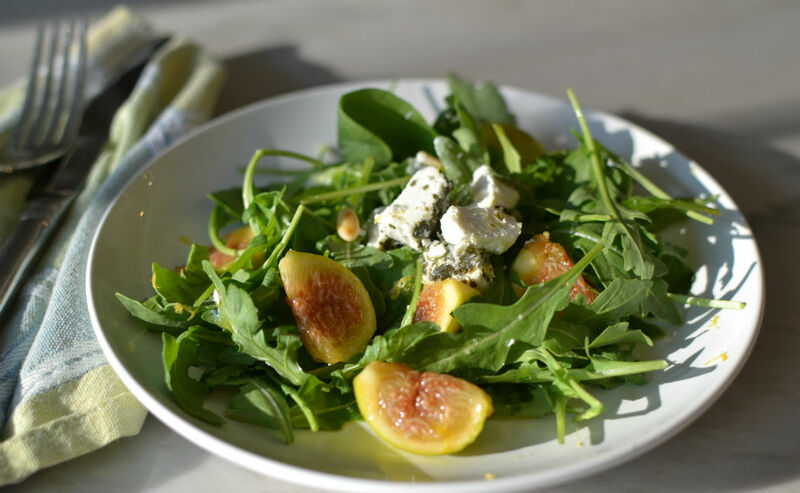 Scatter pine nuts and figs over arugula. Place medallions of goat cheese on top (easier to slice if placed in freezer for 20 mins first). © 2012 Pamela's Gluten Free Recipes. All Rights Reserved.